ESET is one of anti virus sites that is famous among PC, Mac, and another mobile users. And right now, ESET has launched the latest beta version from ESET Smart Security 5 and Anti Virus 5 and you can download both versions now. One of the latest features owned by ESET is “Gamer Mode”. By using this feature, when you are on Full-screen more, ESET Smart Security 5 / Antivirus 5 will automatically divert into the Silent Mode which can save the resources, so that you can keep playing the game or keep being concentrated on the important papers without being disturbed by the pop up messages. Another important features is that now you can adjust the system more detailed by determining the setting for the process of registry system and the active program. ESET Smart Security 5 and Antivirus 5 has a clean appearance and easy to be used by the users. You can download the beta version now. licensenya biar lama & bisa update online dong mas..
cara update secara offline untuk v5 beta ini bagaimana ?? apa memang harus update secara online..
saya sudah instal antivirus nya…. tp kenapa muncul ” maximum protection is not ensured”? dan tampilan antivirus nya berubah dari warna hijau ke merah…. minta activate product nya dong gan…..
hi,is this a 30 day trial or is it permanent? latest feature Eset Gamemode this feature is good. 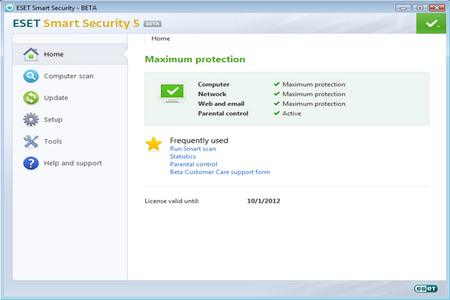 yes ESET Smart Security 5 good working antivirus ,this a 30 day trial or is it permanent. how can i offline update this version?